This BRAND NEW Nuevo digital pocket scale manufactured by US Balance features a blue backlight and easy 3 button controls. Ready to use out of the box. This versatile unit is perfect for measuring herbs, spices, even jewelry! Comes with a 10 YEAR consumer warranty. 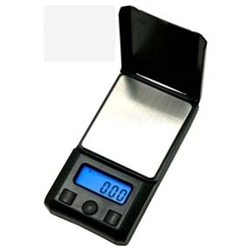 - Overall Size: 4.1" x 2.2" x 0.8"
- Platform Size: 2.3" x 2"
Use the tare feature with any container to zero the scale and not count the weight of the container. Note: The color of the scale may differ from the pictures.